Truck drivers who fail to adhere to their prescribed sleep apnea treatment significantly increase their risk of serious preventable crashes, according to a recently published study on the subject. The study compared 1,613 truck drivers with obstructive sleep apnea with the same number of comparable drivers without the condition. The drivers with sleep apnea were given a positive airway pressure (CPAP) machine that downloaded objective data concerning the drivers’ adherence to their treatment. 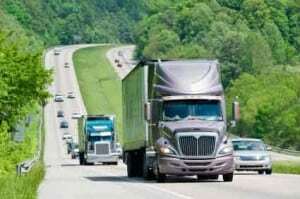 The study found that drivers who completely or even partially adhered to the treatment were involved in crashes at about the same rate as the control group, while the non-compliant truckers increased their crash rate by five times. Currently, federal guidelines rely on truck drivers to self report sleep apnea problems as part of a general assessment for their physical fitness for duty. However, various safety organizations have advocated for stronger and more wide-ranging guidelines regarding sleep apnea and driving, given the risks involved. According to some estimates 25 million American adults suffer from sleep apnea, which can result in daytime sleepiness and drowsy driving. The CPAP treatment keeps the airways open during sleep by providing a steady stream of air administered through a mask. The data from the current study was gathered as part the trucking company Schneider’s 2006 screening, diagnosis, and treatment program for its employees. A team was put in place to help drivers maintain their CPAP treatment. Schneider employees who did not comply with a treatment program were ultimately removed from their positions due to the safety hazards they posed to themselves and others on the road. However, there is nothing to prevent such drivers from taking positions with other firms, most of which due not conduct such rigorous screening. The study suggests that there may be many truck drivers on the road who pose drowsy driving crash risks that are not being properly monitored. Drowsy driving is at the root of a large number of serious crashes, including those involving commercial vehicles. Drivers, including those who operate big rigs, who are aware of their sleep apnea condition but did not properly treat it may be held liable in a court of law for any accident that results due to sleep deprivation. All motorists are responsible for driving in a state of mental alertness, not compromised by factors such as alcohol, drug use, or exhaustion. In cases where a trucking company knew about and did not reasonably respond to sleep apnea risks in its drivers, that company may also be legally responsible for resulting accidents. In truck crashes caused by negligent or drowsy driving, victims may file a personal injury lawsuit in pursuit of fair compensation for lost income, hospital bills, emotional trauma and other losses. Maine car accident victims are encouraged to contact the law offices of Hardy, Wolf & Downing to learn about their options for legal recourse. To speak with a truck accident lawyer about your case, please call l 1-800-INJURED. The consultation is free and without obligation.